Matthew Desmond’s award-winning book Evicted: Poverty and Profit in the American City and the Eviction Lab dataset have sparked discussions on eviction, leading many cities to explore ways to lower their eviction rates and to understand the local context surrounding evictions. The causes of evictions vary considerably. Often, it’s a short-term cash crisis brought on by the loss of a job, a hospitalization, a car repair, or a funeral. Market pressures, affordable housing shortages, renter protections, and legal processes also change from place to place, creating different incentives for landlords and pathways for renters in each local housing market. How can local stakeholders find out who is affected by eviction in their communities and what policy levers are available to help them address the crisis? In North Carolina, a cross-sector partnership—consisting of Mecklenburg County and the University of North Carolina at Charlotte Urban Institute (both members of the Urban Institute’s National Neighborhood Indicators Partnership)—took steps to better understand how evictions affect their community. The county has focused on supporting data and research through the Mecklenburg County Housing Instability and Homelessness Report series. These steps can guide other communities as they aim to lower their eviction rates and help residents stay in their homes. 1. Assemble a diverse group of stakeholders. Evictions are a multisector issue, in terms of both causes and solutions. NNIP’s Charlotte partners brought their expertise in data analysis and housing policy to the table. They also convened an advisory group of stakeholders who could provide context around eviction data and who could act on information gathered. These stakeholders included the sheriff’s office, county agencies, nonprofit crisis assistance organizations, philanthropy, legal aid, landlords, and apartment associations. 2. 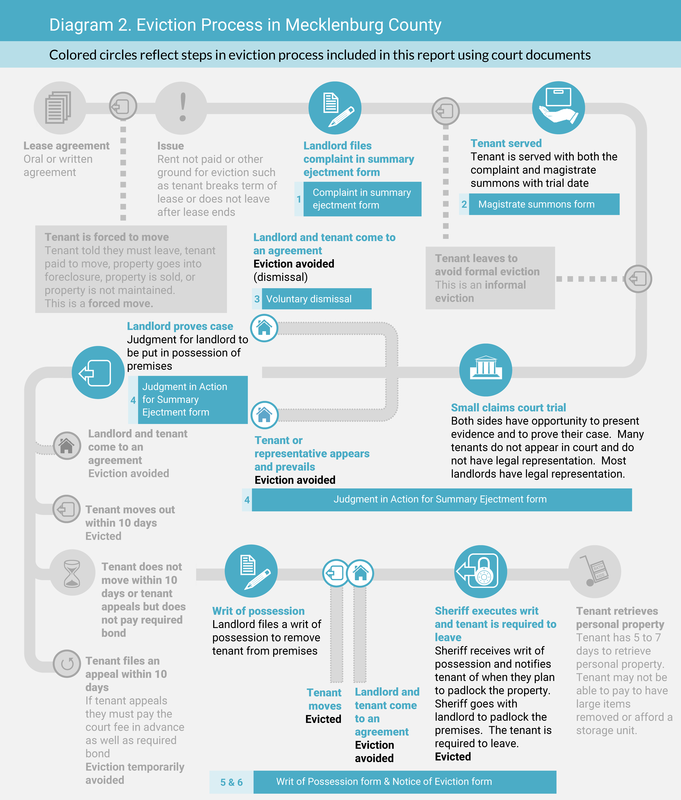 Map out the eviction process. A formal eviction carried out by the sheriff’s office is not the only type of involuntary move a household might face. When might an informal eviction occur? What forces might influence the path to eviction and the consequences afterward? Legal Aid of North Carolina provided critical information on the complex legal process to the Charlotte advisory group. This mapping process revealed potential points of intervention and highlighted the difficulty households could face in navigating the legal system. UNC Charlotte obtained formal eviction data from the courts and from the sheriff’s office. In their first report, researchers examined trends in evictions, found that evictions increased in certain months, and figured out what share of people lost their homes to eviction. Local community data providers, applied academic centers, and advocacy groups have been tracking eviction data in many communities across the country. If eviction data aren’t readily available in a community, local leaders can check out data on their city from the Eviction Lab in the short term. For future analysis, they can ask their local courts to publish more data. 4. Share the information broadly and provide action steps. With support from local partners, UNC Charlotte brought Matthew Desmond to speak at an event just before the first report was released. To complement the event and increase community awareness of evictions, Mecklenburg County Community Support Services organized a citywide book club with study guides that included data from the Mecklenburg Housing Instability and Homelessness report series. The book club spurred interest in the issue among many community members, including neighborhood organizations and churches. With each analytic report by UNC Charlotte, Mecklenburg County Community Support Services also prepared a “Toolkit for Action” that assists community members in applying the information from the report to effect positive change. 5. Dig deeper and maintain focus on the issue. UNC Charlotte followed the first report with two more reports that helped the advisory group and the community understand different aspects of eviction. They learned in which neighborhoods evictions were most concentrated and what neighborhood-level factors might be at play. Volunteers (including some who were introduced to the issue in the book clubs) helped enter data on a month of detailed court records to determine details of eviction cases, such as what share of tenants had legal representation and how much money they owed to the landlord. Released over eight months, each report presented a new angle and kept public attention on the issue. These five steps sparked change in Charlotte. The reports and toolkits increased visibility of the impact of evictions on the community and highlighted the need for increased legal assistance to support households going through the eviction process. After the reports’ release, the United Way and Mecklenburg County increased their funding for legal assistance for people facing eviction, with the county funding Legal Aid of North Carolina to provide this assistance for the first time in the fiscal year 2019 budget. If other communities take similar steps to understand how eviction affects their residents, they can more effectively tackle the causes and consequences of evictions in their area. The skyline of downtown Charlotte, NC. Photo by f11photo/Shutterstock.